Karina Nuvo couples classic musical influences with her own heartfelt instincts and authenticity, resulting in an unrivaled sound best described as "Nuvo Soul". Her vocal styling conveys a sultry unapologetic power, balanced by her sensual clarity and broadened along a gospel / rock edge. She writes and sings fluently in both English and Spanish, extending her appeal across cultures. Her music encompasses all cultures, races and genders - gospel, R&B, disco, and Latin jazz. 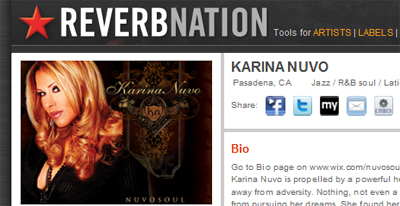 Karina has finished her highly anticipated Debut album "NUVOSOUL", in both English and Spanish, which she co-wrote and produced. It blends all that is true to Karina's style. There's Soul, Jazz , R&B and Latin all mixed in to a truly unique and inspiring Album. 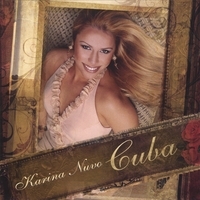 In particular, her record includes a spicy salsa-flavored rendition of Shining Star, Karina's homage to the group that has influenced her the most, Earth, Wind and Fire. Her message is honest and positive. Her delivery is uplifting. She is determined to spearhead a bilingual soulful sound and hopes to one day bring her music back to her parents homeland. Karina is polished and ready to take on the world with her music and style. .
Karina says, "My music is what I've created from all the things that truly inspire me. Its NUVO SOUL."